Freedom To Glide (f2g) is formed by musicians Pete Riley and Andy Nixon. They have many years played together in the Pink Floyd tribute band Dark Side of the Wall. In the year 2011 the duo made the 6 track concept “The Wait”. It centers around the experiences of a young WW1 soldier leaving his homeland, fighting a war he can't understand and his later recollections of the futility of it all. “The Wait” forms part of the unfolding Freedom To Glide collection of WW1 inspired releases. Late 2013 the band released the first part of a war themed trilogy entitled “Rain”. This review is about the second part of that trilogy that has been released recently. The name of the album is “Fall”. On the website of the band you can read the story of CPL. Robert Wilson (1896-1986). At the outbreak of war in 1914, at the age of just 18 Robert and his pals from the local villages all took Lord Kitchener's call and joined the Kings Own Royal Lancaster Regiment. After the war he turned out the only survivor of that group of friends. Robert's war ended at the Some. He was shot and the bullet hit him in the hip shattering his pelvis. After lying alone in the mud for hours Robert was carried back to the British line by a German soldier. The unknown German soldier was a doctor and simply told Robert that he was there to save lives, not take them. The two men never saw each other again. On the album “Fall” you can find the following tracks; “Fall”, “Silent Code”, “Names in the Stone”, “Toll”, “Playing God”, “Exit Wound”, “Enigma”, “The middle Game”, “Through of War”, “Solace”, “Sleep under the Flag”, “Another” same and “October”. I think that some of the reviewers who will review this album are falling into a obvious pitfall and will describe all the music of this duo as Pink Floyd influenced. But I think that Freedom To Glide has managed to develop an own unique musical style. I would like to describe the music more as a kind of crossover and cinematic rock with some progressive elements. An example is the track “Toll”. On top of a broad carpet of keyboard strings you can enjoy a beautiful electric guitar solo which reminds me more of Camel then of Pink Floyd. “Playing God” has a beautiful acoustic guitar basis and lovely vocal harmonies and melodies. Andy Nixon is blessed with a great voice. The overall atmosphere of the music is on the mellow side. The album has a strong opening with the tracks “Fall” and “Silent Code”. The later has beautiful and delicate sung vocals. You can find some wonderful melodies on this album. In “Exit wound” and “The middle Game” the band uses the voice over of Louise Wilson to give the pieces some extra atmosphere. After a beautiful soaring guitar solo the track “Exit Wound” flows seamlessly into the longest (8:03) track of the album entitled “Enigma”. One of the little gems of this album. Piano, fretless bass, acoustic guitar, keyboard strings and beautifully sung vocals. Slowly the tension of the music is building up towards a guitar solo in the middle section before the music becomes more atmospheric and cinematic again. Wonderful track with great diversity! The short and atmospheric “Sleep under the Flag” impacts by the impressive lyrics. 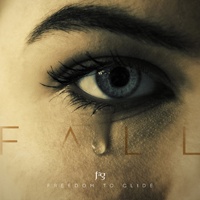 “Fall” the second part of the war themed trilogy by Freedom To Glide is an album full of beautiful and cinematic rock music with some progressive elements. The album sounds great and is in balance. The spectrum of the music lies on the mellow side. You can find some great melodies on this wonderful album. Looking forward to part three of the trilogy. If you like mellow and cinematic music with beautiful guitar work and lovely vocal melodies, please check out the music of Freedom To Glide (f2g).